Domain-based Message Authentication, Reporting and Conformance (DMARC) is an Inbound email policy built on top of SPF and DKIM records, designed to detect and prevent fraudulent email. When you add a DMARC policy to your domain, you choose to inform the recipient that your emails are protected by SPF and/or DKIM records, and what to do if your DMARC policy fails alignment with those records. Sender adds a DMARC policy to their domain. The recipient checks if the email contains a DMARC policy. If so, the SPF/DKIM records mentioned in the sender's DMARC policy are validated. If the SPF/DKIM records pass validation, they must then pass something called 'alignment'. If 'alignment' is passed, the email is received. If 'alignment' is not passed (even if SPF/DKIM check are passed), then the message fails. This helps to ensure that fraudulent activity appearing to come from the domain is blocked. The DMARC policy checks the domain name listed in the message's From: field. It then compares that domain to other authenticated domain names listed in the email's header. If they are identical, your DMARC policy is aligned. If not, you should contact your email host and ask for instructions on how to ensure your records are aligned. The alignment in your policy can be set as strict or relaxed. What if the message fails alignment? Configure an SPF and/or DKIM record on your domain. The domains mentioned in all of these areas must be identical, otherwise DMARC will fail alignment. Create the TXT record. Below is a basic configuration that handles the majority of your DMARC needs. Just make sure to adjust the email addresses to the addresses you created above to receive incoming reports. View the section below for further details on the different options you can use. In your panel, navigate to the Manage Domains page. Click the 'DNS' link under your domain. Within 4-6 hrs the record will update online. 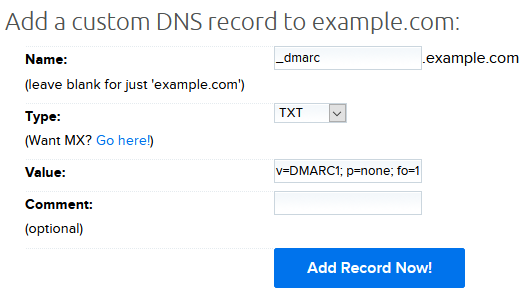 There are 2 required tags, v and p.
The v tag identifies the text record as a DMARC record. This must be the first tag and have a value of DMARC1. p=none No action should be taken for emails that fail DMARC authentication. p=quarantine If an email fails DMARC authentication, it should be treated as suspicious. How this is handled is up to the recipient, for example, it may be placed in a SPAM folder. p=reject If an email fails DMARC authentication, the recipient should reject the email during the SMTP transaction. These indicate where reports are sent. rua=mailto:dmarc_agg@example.com This address is where aggregate DMARC reports should be sent to. ruf=mailto:dmarc_forensic@example.com Indicates where forensic DMARC reports should be sent to. fo controls when a failure report is created. 1 Creates a report if any authentication steps fail. d Creates a DKIM failure report if the message had a signature that failed evaluation. s Creates an SPF failure report if the message failed SPF authentication. A setting of fo=1 is recommended as it provides the most amount of data about any failures. adkim Sets a strict or relaxed DKIM identifier alignment. (The default is relaxed). aspf Sets a strict or relaxed SPF identifier alignment. (The default is relaxed). rf Format for failure reports. (The default is Authentication Failure Reporting Format, or 'AFRF'). ri Sets the number of seconds between sending aggregate reports. (The default value is 86,400 seconds, or one day). pct Sets the percentage of messages DMARC is applied to. Setting this to 100 would apply to every email and is recommended. The sp tag is used to set a different reporting policy for a subdomain. For example, you could set the primary domain to use p=reject while setting all subdomains under this domain to use sp=quarantine. Why is my email going to spam?